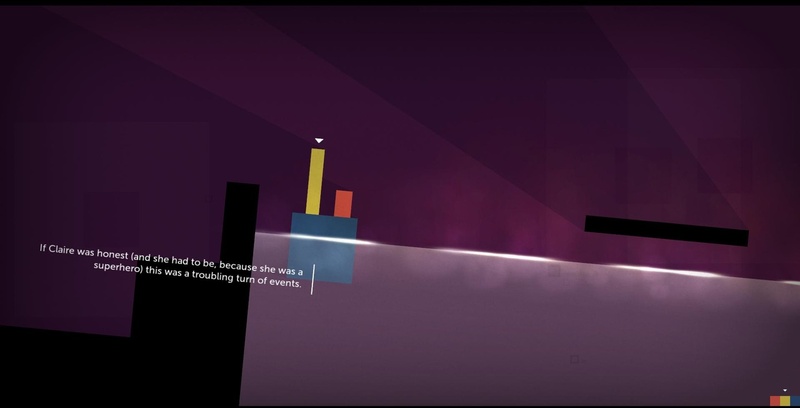 Thomas Was Alone is a video game created by independent developer Mike Bithell. 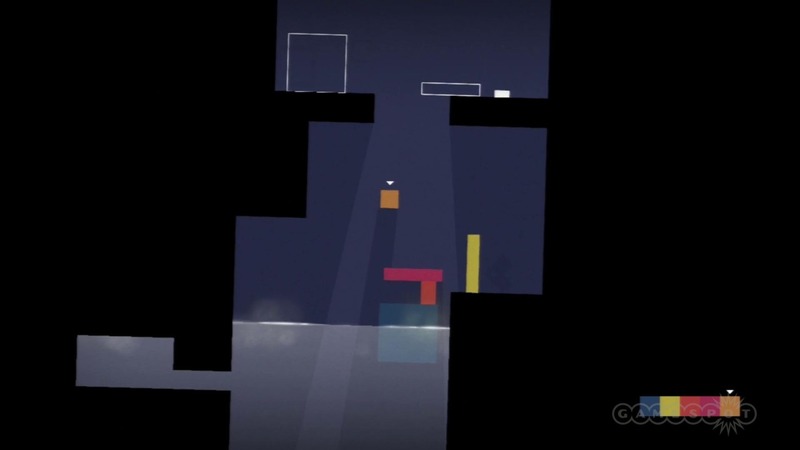 The player controls a collection of quadrilaterals, solving puzzles and hopping from platform to platform, combining the skills possessed by the different shapes, to lead all of them to the goal. It’s a great game. Thomas Was Alone is a philosophical commentary on the nature of life. Through the conceit of self-developing AIs in a complex computer network (each AI represented by a different shape of a unique colour), that come into being and gain self-awareness without the aid of the network’s creators, Bithell shares a worldview that human life itself may have developed and evolved by itself and without the design of a creator. Thomas Was Alone is an ensemble comedy. Thomas, an unassuming red rectangle and the first AI to become self-aware, is soon joined by a cast of colourful characters. There is Chris, a small orange square with a chip on his shoulder; John, a confident and good-natured long yellow rectangle; Laura, a chirpy pink rectangle that can bounce other shapes; Clare, a hefty blue square with water-resistant superpowers; Susan, a benevolent purple goddess with an amazing double-jump; and many more besides. These shapes help and hider each other; they rub each other up the wrong way; they learn to fear and to love. All the while, their story is narrated charmingly by Danny Wallace. It’s funny and endearing. Thomas Was Alone is a political tract on rebellion and revolution. The AIs in the computer network learn to think for themselves. They learn to join together for a cause. They figure out how to alter the conditions of their world to make it better. They defy the designs of the network’s creators, ultimately breaking free from the confines of the system. It’s highly suggestive of the need for people to resist oppression, educate themselves, and work together to improve their world. The computer network’s creators made something they didn’t understand and couldn’t control. Thomas Was Alone is a treatise on the dangers of uninhibited technological progress. The computer network’s creators made something they didn’t understand and couldn’t control. The story has a framing device: between every few levels, we are shown a quotation from one of the creators, describing with hindsight how they lost control of the system. We are not told the consequences of this event, so we can’t be sure if they were good or bad, but the quotations are laced with the kind of paranoia familiar to anyone who watched the doomsday cyber-scenario films of the 1990s (like The Lawnmower Man) or anyone who goes to see Transcendence this year. Thomas Was Alone is an anthropological study on the development of human society. We watch individuals learn to move about their world, learn to co-operate, learn to avoid danger, learn to love, learn to make goals, and ultimately learn to shape their world. It’s the development of human society in microcosm. Thomas Was Alone is a statement against the superficial treatment of complex human individuals. The cast appears to be nothing but a group of squares and rectangles. It’s easy to judge these as nothing but blank shapes, but through Wallace’s narration and the unique actions of each character, we learn that each shape is a true individual with traits and abilities beyond four sides and four corners. It’s a clear message that we should look beyond the superficial when meeting new people. Thomas Was Alone is a parable about inevitable evil in our society. After the initial heroes have liberated many other AIs in the system, one AI simply named “Grey” intends to find a way to corrupt the system and all of the other AIs to serve his unlimited ambition. Tellingly, it’s not entirely clear whether or not Grey is defeated. It’s a reminder that we cannot be complacent about human nature – that there is an evil within us, that our society is always at risk of corruption, and that we must always be vigilant. Thomas Was Alone is philosophical; it is funny; it is political; it is paranoid; it is scientific; it is moral; it is a cautionary tale. But above all, it is a great game. Play it now.